An amazing thing happens when children are empowered to think mathematically in an emergent, inquiry-based classroom - they become the teachers! Our children have been incredibly motivated to explore growing geometric patterns, sparked by their interest in creating intricate structures from wooden blocks. Today some of the children decided to revisit the mini blocks and we challenged them to create their own growing patterns. We discussed what made the previous patterns successful and how others would recognize that their idea was also a pattern. According to Jo Boaler mathematical mindset is a huge indicator of whether or not a child will be successful in math and that when children are provided opportunities to explore with rich learning materials in supportive situations, there is no limit to the math learning that will take place. Boaler suggests providing children with low floor high ceiling tasks that have multiple entry points and an endless number of ways to differentiate in order to challenge the most ambitious learners. We were impressed with the growing pattern of one child in particular. 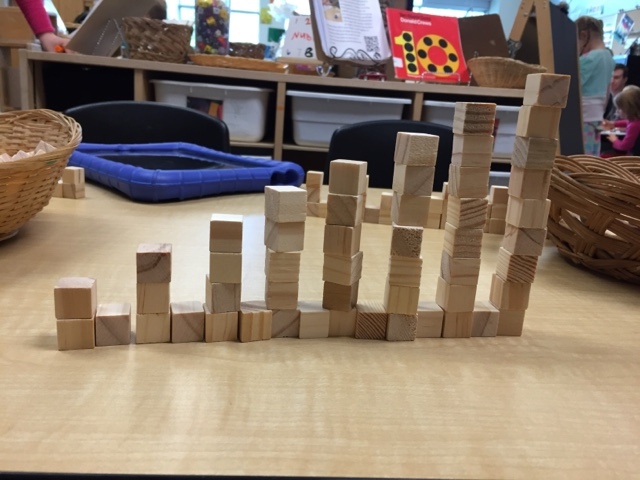 He thought slowly and deeply as he manipulated the blocks, and then created a unique pattern that we have not yet explored together in our classroom. 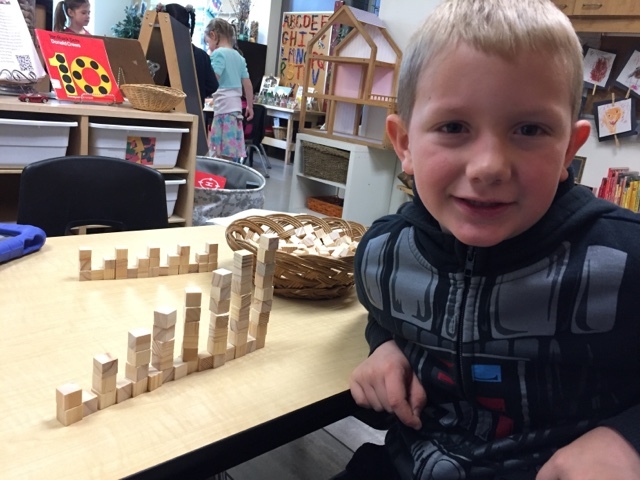 We were amazed at the complex nature of the pattern, how carefully planned and built it was, and how well this child could articulate his thinking. 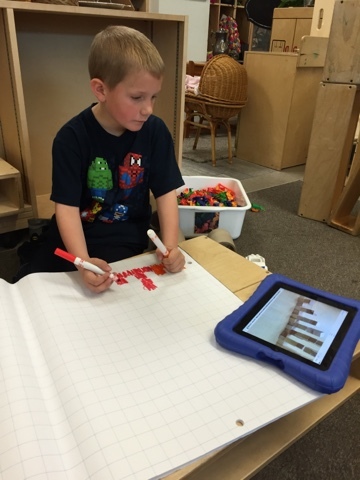 He used the iPad to take a photo of his growing pattern and then set to work to transcribe it onto grid paper. "I want to remember what it looks like so I can show others!" he explained as he worked. He carefully referred back to the photo as he counted the squares and ensured that the pattern was as he wanted it. When he was finished we took a photo of his work. "I made a mistake on the fifth tower," he shared. "I added an extra block but it wasn't a big deal because I crossed it out!" Accepting one's mistake as a learning opportunity and fixing the math to make it better is a major milestone in cultivating a mathematical mindset. After sharing the pattern we asked if he would like to have it tweeted so that others could see what he had created. He was very excited about the possibilities of this and wanted us to ask other classes to see if they could explain what they noticed about his pattern. We showed him the previous experience of using padlet on the blog to gather math ideas virtually from many places and he excitedly asked us to do this. "It's like I'm the teacher now, " he grinned. "I'm helping other kids learn how to do math too!" For us, this was an incredibly proud moment. 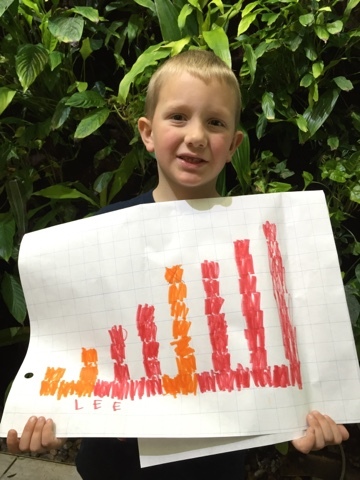 This child, so eager to engage in an open-ended math experience, had now shared his learning beyond the 'walls of the school' and was hoping to engage other children in rich, mathematical thinking. Please consider the growing pattern, either as a reader of this blog or as a teacher together with your students. If you have an idea about what you observe, please click directly on the padlet below and type your answers (or insert a photo or video) right on the screen! We will check it daily and then respond to your ideas! Thank you for helping us consolidate and share our math thinking beyond our classroom and help children see that math is a deep thinking, slow, collaborative process that can be fun and exciting!